About: Launched in May 1998, Be At One boast an extensive range of over 100 cocktails, beers and wines for you hearts delight. The warm and friendly atmosphere is packed with people who are just out to let their hair down and have a rocking good time. The music takes you back in the day to 70's funk anthems and the 80's hits from groups such as Spandau Ballet and Duran Duran. They serve bar food and snacks in a relaxing atmosphere with sofas and intimate nooks and crannies, and can cater for private parties. "Rude and poor quality, a not so happy hour"
I absolutely loathe chains. I hate the monopoly, the poor quality to maximise profits, the tedious menus and boring drinks, the lack of effort to the customer. 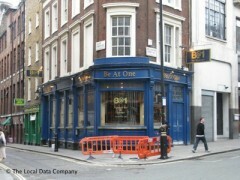 Be At One may only have six branches in London, but I encountered all of the above and more at this bar. It’s very difficult to exist without occasionally visiting somewhere with a 2 for 1 happy hour. Deals such as these get the punters in, and I include myself here as someone who is often well over their overdraft limit wanting a cheapish night out. But after two occasions here I won’t be drawn in again, no matter how many sickly drinks they wish to give me for the price of one. The Covent Garden branch, being the size of a generous bathroom gets ridiculously busy to the point where you end up practically hanging outside by clinging onto the frame of the window. There are very few seats and moving around becomes a difficulty once all the after work drinkers arrive. On visit number one, I mistakenly ordered more drinks than I should have for the group that I was with. As soon as I realised my mistake I alerted the barman, who tutted loudly and moaned “Next time, could you get it right please?” He had only poured one drink, so I couldn’t see what all the fuss was about. I then tried to figure out if my Mango Bellini had been made deliberately awful or if that’s simply what he thought it should be. The mango juice was thick and sludgy and had been mixed with what tasted like Lambrini. On visit number two, whilst ordering at the bar I thought it would be helpful to point at the drinks menu as the noise levels were high. “I’m a barman darling, I don’t read” was the reply I got. I would imagine he doesn’t. We grabbed our drinks and headed outside as it was too crowded and hot, and we couldn’t even finish them. My Irish Disco Biscuit was too rich, made with Baileys and Creme de Menthe, blended with cookies and vanilla ice cream. It tasted nice on the first sip, but after a few more I began to feel nauseous and we decided to go somewhere else.